NIGHTHAWK. By Clive Cussler and Graham Brown. Penguin Audio. Read by Scott Brick. 11 ½ hours; 9 CDs. $45. Also available in hardcover from G.P. Putnam’s Sons. The United States’ most advanced aircraft/spacecraft has gone missing, and the Air Force and the National Security Agency have called on NUMA, the National Underwater and Marine Agency, to help in the search. When Kurt Austin, NUMA’s intrepid head of special assignments, is hustled off a Hawaiian beach to lead the charge, he and Joe Zavala quickly begin to suspect that the secretive NSA isn’t telling them everything. Clearly, a lot is at stake, and to complicate things, dangerous Chinese and Russian operatives are also looking for the craft. The Nighthawk, as it’s called, had been orbiting the Earth for three years on a highly secret initial mission. It vanished mysteriously when it was preparing to land in California. The last signals received indicate it was somewhere over the South Pacific. As Kurt and company soon learn, the Russians and Chinese aren’t just interested in the Nighthawk’s advanced technology. The mission involved harvesting “mixed-state matter” from the polar magnetic field, and if the matter isn’t handled properly – including being kept extremely cold – the matter and antimatter will combine to create a tremendous explosion. But if one country can secure it before it destroys much of the world, that country will have enormous power. Time is of the essence because the batteries of the cooling system will soon run out. Kurt and his small band of colleagues, including Emily Townsend of the NSA, must race to figure out where the Nighthawk is while thwarting attacks by the Chinese and Russians. This novel is in the best tradition of Kurt Austin’s NUMA adventures – fast-paced, full of action and intrigue, brimming with unlikely feats and laced with occasional humor. The action ranges from the Pacific to the Andes, and from submarines and small submersibles to a variety of aircraft. There are plenty of high-tech gadgets and gizmos. If you’re looking for plausible, well-explained science or complex character development, you’d better go elsewhere. But if you want to be entertained, kept on the edge of your seat and occasionally treated to some interesting bits of history, this book is worth your time. As an added treat, the ending, one of the best yet, will leave you smiling, if not laughing out loud. This is a good beach read, or, if you go for the audio version, a good tale to entertain you while you’re driving to that vacation destination. 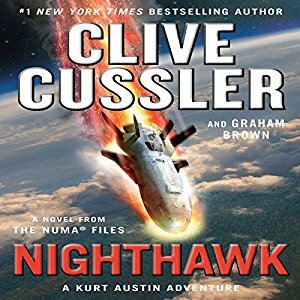 This entry was posted in Action/adventure, Audio Books, Popular fiction and tagged Clive Cussler, Kurt Austin, Nighthawk, NUMA. Bookmark the permalink.